Bandhan Bank is exploring inorganic route to pare promoters' stake. 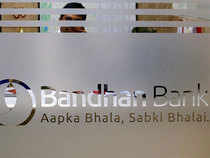 Mumbai: Bandhan Bank on Friday received exemption from markets regulator Sebi with respect to restriction of promoter selling shares within one year of listing, paving the way for reducing of stake through acquisitions. In a move towards divesting promoter shareholding to meet the Reserve Bank of India’s licensing norms, Bandhan Bank said it received an exemption from the Securities and Exchange Board of India on the lock-in of one-year on the equity shares held by the promoter and the eligibility condition of one year from listing. The bank is exploring inorganic route to pare promoters' stake after the Reserve Bank of India restricted them from opening branches without prior approval and froze remuneration of managing director Chandra Shekhar Ghosh. RBI took the decision after the bank failed to bring down the shareholding of Non Operative Financial Holding Company (NOFHC) to 40% as mandated under the licensing condition. Bandhan Bank started operations in August 2015 and listed on the bourses in March 2018. Bandhan Financial Holdings Ltd owns 82,28% in Bandhan Bank which must be brought down to 40%. The deadline for that exercise was August 22. The bank is exploring all the options including offer for sale of shares, merger of non-holding companies and inorganic growth to bring down promoter’s stake. Shares of the company fell 0.42% to Rs 468.85 ahead of the news on BSE.